In this issue: demons go down, bureaucrats get their comeuppance, and third-world kidnapping murderers go splat—plus the August contest! Soccer mom and demon fighter Barbara Everette is back in an intricately interwoven monster noir adventure, the sequel to bestselling Princess of Wands. Now Barb must save her assistant, a Nordic priestess and stripper, from demon abduction. Warning: portions of this book set at alternate fantasy world Dragon*Con! Alex Marlow and Ripple Creek Security's best personal security team really don't like their client, World Bureau Minister Joy Herman Highland. 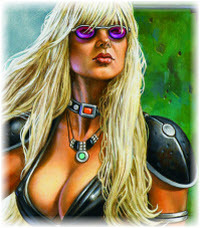 And with a tough job to do in protecting her, the Ripple Creek warriors have no qualms about explosions on galactic news. In fact, they kind of enjoy it. 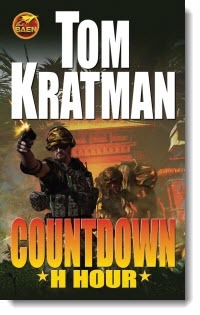 The third hard-hitting entry in the Countdown modern-day military adventure series. In the Philippines outback it's hostage rescue time for Terry Welch's special operations company. No help, no backup, team members in the soup. Welch knows there's only one solution: do whatever it takes. Your planet. Your rules. Earn free ebooks. Stake your claim on Planet Baen. 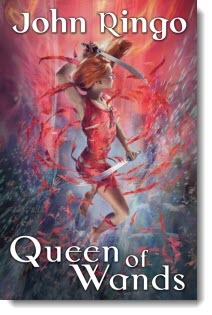 To celebrate the publication of John Ringo’s Queen of Wands, we’re asking you to out the spacetime travelers among us! Send us your top five list of convention-goer types who might be mistaken for interdimensional travelers. And since portions of Queen of Wands take place in a science fiction convention, we believe now is the time to produce an identification guide and contact list for the not-from-this-universe among us. No names, just blatant stereotypes, please! Winner to be judged by Baen editors. Winner will receive a rare Queen of Wands advanced reading copy singed by interdimensional being John Ringo himself. Soccer mom and demon fighter Barbara Everette is back in an intricately interwoven monster noir thriller, the sequel to bestselling Princess of Wands. 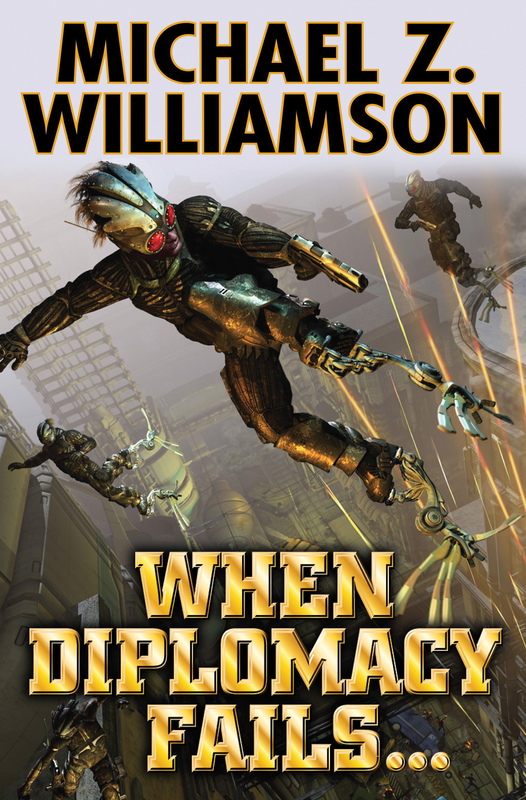 High tech near-future mercenaries Ripple Creek Security must protect an obnoxious world government minister from the scores of enemies who want her dead—and killed in the worst possible way. 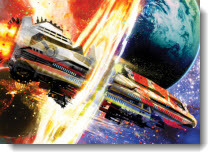 Two bestselling novels of science fiction adventure set in the Forerunner universe from legendary storyteller Andre Norton together for the first time. Ancient alien artifacts bring slavery and freedom in far future worlds of adventure. Contains Ice Crown and Brother to Shadows. 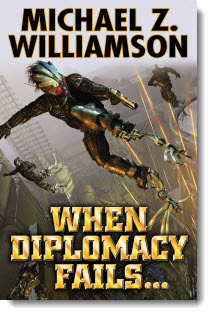 Theo Waitley’s saga continues in the Liaden Universe® series. Now that Theo has survived the Pilot Academy, her destiny as master pilot and leader of a powerful Liaden clan calls, and there are lots of enemies who will try to make sure she’s quite dead before she has the chance to make an answer. Tom Kelly: a fixer in an alternate history where the American space program is on the line against alien invasion. Kelly will do whatever it takes to save humanity—and is prepared to annihilate anyone who gets in his way. Contains Skyripper and Fortress. Brion Bayard had been an American diplomat—until he was abducted on the streets of Stockholm and thrust into an alternate universe where his own doppelganger is a ruthless tyrant. The winner of our Baen Books June 2012 Going Interstellar Contest as judged by NASA scientist and Going Interstellar co-editor Les Johnson is engineer Chuck Ballard. Chuck will receive a copy of groundbreaking space science/science fiction collection Going Interstellar signed by editor Dr. Les Johnson and five free ebooks. 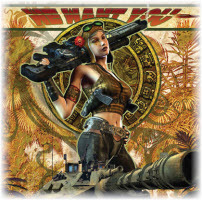 Don't forget to check out the latest Ebook releases here latest Ebook releases, as well as Baen.com free fiction and articles including new a new John Ringo comic gem here and Tom Kratman’s refutation of military “decision cycle” theory here.